Me - Mani, Zubin and our family have built a building with 4 fully loaded studio apartments with all amenities keeping in mind leisure / business travellers. Located just off the main road near Café Coffee Day in the bustling village of Candolim in North Goa and designed in such a way that you don't miss your home. We can be called and you can put in your special requests if any in advance. We have done our best to make you feel comfortable by providing all possible amenities like a washing machine, microwave, an induction plate, kettle for hot water, fridge, TV, Tatasky and much more. WE HAVE PORTABLE WIFI TOO. We have daily cleaning for you.All in all you will be feel welcomed and at home..
Machine ,portable wifi ,induction [only for 6 nights and above ] with few utensils, all crockery and a power back up in case of electricity fluctuations. Have a look at the pictures and its exactly the way it is shown.2 of the studios are with a bar and 2 bar stools and 2 are without the bar and the bar stools.Rest of all the amenities are the same.Each studio has a nice spacious balcony with 2 chairs as well. We keep a common iron and the same can be given when asked for . We are parsis so our food is a fusion of iranian and indian so its full of flavour.We can deliver our home cooked food as well for you with a nominal cost . We have kept a folder with all sightseeing ,few restaurants , chemist and more relevant information to make your stay easier. We live 2 mins away so you can shout out for us anytime. Our family comprises of my husband and my 2 boys.We were running a restaurant called Zuperb in holiday street calangute for the last 5 years.We were asked to leave the restaurant by the owners in 3 days time.They didnt give us a notice period or any time to plan and take up another restaurant.We had built a reputation for ourselves on trip advisor amongst the top 5 throughout the year .Our food was loved by all . We took up this venture and started with these studio apartments with another owner who gave us his property to run and thats how we have begun. We can be called and you can put in your special requests if any in advance.We have done our best to make you feel comfortable by providing all possible amenities like a washing machine, microwave, an induction plate, kettle for hot water , fridge and much more.A small welcome kit which has some food items ,tea coffee sachets, toothbrush etc is also given with lot of affection from Zuperb family .We have a very reliable caretaker who can run few errands for you from 5 pm to 6 pm.He is at our premise from 9 am to 7 pm to look after your comfort.All in all you will be feel welcomed and at home. Lovely apartment. Very clean. Ideal location. Mani and Zubin couldn’t do enough for us. They were very friendly and helpful. Thank you for your great review.Much appreciated. Coffee shop that is open from 9 am upto 2 am in the night and one of the oldest bakery a few steps away. 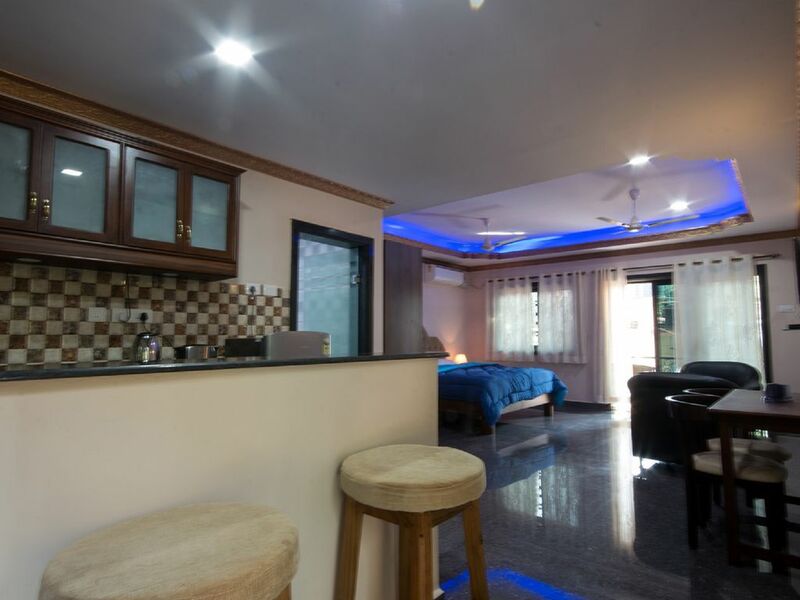 Very centrally located .Walking distance are restaurants,liquor shop,supermarkets,money exchanger,ATM, gym.Located within a leisure 15 mins walk to Candolim beach.